Oracle has gotten cloud religion. 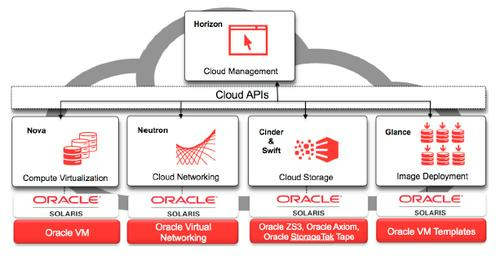 After initially slamming the cloud concept as meaningless hype, Oracle has introduced a Solaris update that includes a distribution of the OpenStack cloud management platform, promising an easier time for Oracle customers running mixed cloud environments. Solaris 11.2 integrates several OpenStack components, including the Horizon dashboard, Nova compute module, Neutron network module and Cinder block storage module. It was released as a public beta Tuesday and is scheduled for general availability in the summer, said Markus Flierl, vice president of software development for Solaris. "We're transitioning Solaris from a traditional OS to a full-fledged cloud platform," said Flierl, who'll join other Oracle executives at a webcast launch event Tuesday. OpenStack is a collection of open-source components that can be used to set up on-demand compute services on virtualized equipment, including infrastructure as a service. It provides a "single pane" for managing multiple hypervisors. The support in Solaris will allow customers building both Solaris and OpenStack clouds to link the two environments, meaning they'll be able to manage Oracle VMs alongside their KVM and ESX VMs from the same dashboard. They'll also be able to take advantage of new features in Solaris, including one called Unified Archive, which will let them package up a multi-VM OpenStack image using a template and deploy it in minutes, according to Flierl. Adding OpenStack support to Solaris is a big step for Oracle, which usually encourages its customers to follow an "Oracle on Oracle" strategy and has never put much emphasis on interoperability. It already offers plenty of tools, including some in Solaris, for running an all-Oracle cloud. It may be feeling pressure from other vendors who are being more open. OpenStack is backed by IBM, Hewlett-Packard, Red Hat, Rackspace, Cisco and VMware, and if Oracle shunned the platform it risked isolating itself and alienating customers. Instead, last December it joined the OpenStack Foundation and pledged interoperability with a whole slew of products including Oracle Linux, Oracle VM and the Oracle Virtual Compute Appliance. Updates on those products are still to come. Michael Coté, an analyst with the 451 Group, said it's a smart move for Oracle but he expects OpenStack users to react with skepticism. "The first salvo will be to question Oracle's genuineness," he said, and the next step will be to ask, "Yeah, but how much will really be open source?" Indeed, as soon as Oracle joined the OpenStack Foundation last December, critics noted that it hadn't contributed any code to the project. And it still hasn't, according to data compiled by Stackalytics. In an interview, Flierl said his team now has "the approvals" at Oracle to contribute code and aims to be "in synch with the upstream community." It will start with the Oracle-specific drivers and contribute other components as it ramps up development, he said. If Oracle opens up code for features like Solaris Zones or its advanced ZFS file system, that would be a boon to OpenStack users, Coté said, but whether it will is an open question. This is not Oracle's first move to work with other cloud platforms, however; last year it gave customers the green light to run Oracle applications in Microsoft's Azure cloud. The OpenStack support is part of a broad update to Solaris. Oracle is also promising a throughput boost of up to 17 percent for its RAC clustering technology, via a feature called Kernel Mode Acceleration. And it says it can lower memory utilization and improve application performance through a memory prediction technology that analyzes application needs. It's also adding a distributed virtual switch that Flierl touched on in a February blog post and is likely to elaborate on at Tuesday's launch event.